It is more than 50 years since the very last Austin A35 (a van version) came off the production line, but in fact the story of these cars dates back to the late 1940s, when the Austin Motor Company was instrumental in earning vital Dollars for Britain (following the financially crippling War effort), and indeed the firm exported their well-respected vehicles around the globe, greatly helping the country and the company. However, with the smallest model in the line-up being the 1200cc A40, Austin needed a compact saloon to fulfil public demand for a modern vehicle to emulate the hugely successful Austin Seven, that had saved the business in the 1920s and continued to build on that success through the 1930s. Enter the all-new Austin A30, in 1951. Although it looked very much like a scaled-down A40 Somerset or A70 Hereford, in fact this compact newcomer was the very first Austin motor car to be produced with unitary (chassis-less) construction, and packed a great deal into a small package. The first examples (named ‘A30 Seven’ to provide a strong connection with the 1920s/30s Sevens) were all four door versions, representing one of the smallest ever saloons built with four doors, and, as with the pre-War Austin Sevens, they were deliberately made externally compact, to be easier to garage or park, yet they provided internal space to accommodate four adults in relative comfort, in addition to which a large luggage boot (for the size of vehicle) was also built-in. Compared with most small cars of the time the cars were technically advanced too, with a new 803cc overhead valve four cylinder engine providing the power (forerunner to BMC’s ‘A’ Series motor of 1956), and independent, coil spring and wishbone front suspension. The cars have always been praised for their comfortable ride quality. Two door saloons joined the range in 1953, and Austin produced 5 cwt van and ‘Countryman’ estate versions too. The improved A35 (identifiable by its painted grille and large, curved rear window) arrived in 1956, with a stronger and more powerful ‘A’ Series 948cc engine, a remote gearchange with improved synchromesh and a higher ratio final drive. Again customers could buy a two or four door saloon version, a van or a Countryman estate, plus, briefly, a now rare and sought-after Pickup variant. The saloons were discontinued in 1959 (the year in which the Minis and the A40 Farina arrived), but the vans continued in production until 1968. From 1962 BMC’s 1098cc ‘A’ Series engine was installed, giving an excellent power to weight ratio for the time. The final versons of the A35 van featured 848cc Mini engines, mounted longitudinally. 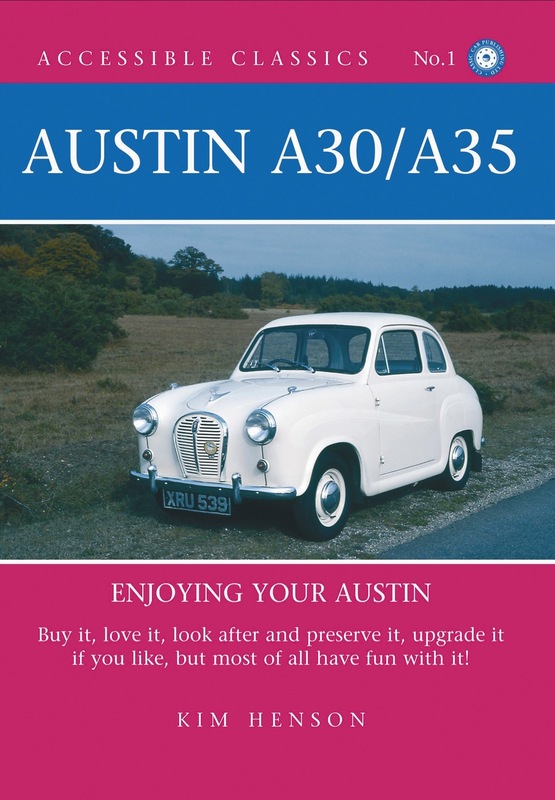 I have been ‘living’ Austins since I was a lad, and spent six years of my life writing about the A30s and A35s. The result is the book shown in our heading photograph; I wrote and published the book myself, and when doing so endeavoured to include as much useful information as possible for anyone interested in, or owning, or thinking about buying, one of these books. The 224 page, all-colour hardback book covers the models’ history and development, buying aspects, maintenance and upgrading information, also true stories of examples that were ‘saved from the brink’, plus much more. In addition to the book always being available direct from me (as author and publisher), for some time it has also been available via a well-known internet shopping outlet. However I have been advised by someone desperately trying to buy a copy that they are no longer available via the well-known internet outlet just mentioned. I would just like to confirm that the books are still available direct from me (if you are interested please e-mail me via this website for more details; if you would like the book delivered by Christmas 2018 please order early as things get busy at this time of year…). The price of the book is £23.95 plus £4.00 UK post and packing, making £27.95 in total. Despatch to UK buyers is by First Class post.